I was remiss in doing my Halloween blog because, well, 700 kids. 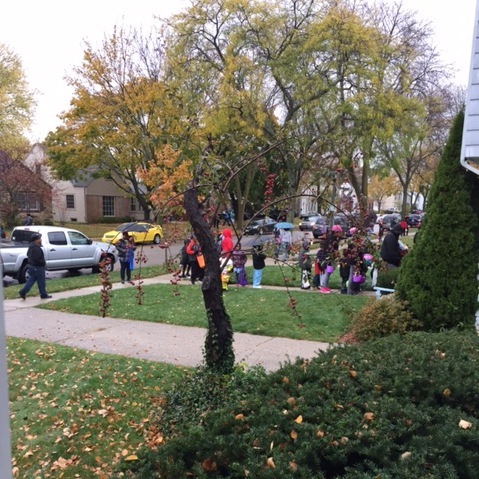 Each year when we have trick or treating in my village, tons of kids show up from all over the city to get a treat. (Nice neighborhood, decent sidewalks, kind people.) This year it was easily 700 (guessing from the 12 jumbo bags of candy and box of 250 fun pencils all gone minus the few “quality checks” we had to give the candy). I typically put spooky sounds in the CD player and sit outside for 3 hours to hand out candy until it’s all gone. This year it rained off and on, sometimes pouring, and the temperature was 48, but the kids still came! I was also interviewed for the local TV news. With wet hair and no makeup, I aimed to give the scare to Halloween to the whole city. Here’s a photo of the kids lined up to the sidewalk at my neighbors’, waiting patiently. The children were so cute! And it reminded me of the KittyCatS CostumeParty set, that has been sitting at my doorway for a good long time, asking for treats! Callie made these kitties based on RL retro costumes—the kind that you and I wore, not our kids. With plastic masks and bright silly costumes, there ARE kittens behind there but first you have to give a treat! They come with a special animation that allows you to ride with them on a broom. 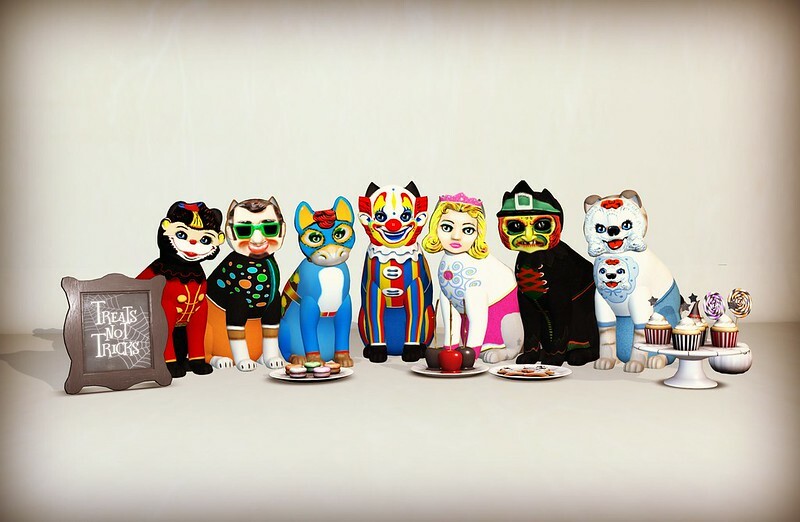 They also come with a week’s worth of food and they are collectible cats with the Genesis KittyCats traits, which means they have the potential to pass on their hidden traits like other Genesis cats. They potentially can pop up new hidden traits that can be discovered only through breeding. And best of all, if you breed two CostumeParty KittyCats, you get a special baby. They are transferable as well so if you want to get one for your friend or loved one as a sweet gift, here you go! The scary thing is they are only available until November 3! Get over there NOW!